Would you like to order a cake & have it delivered in Chiang Mai? Would you like to order a delicious and above all fresh cake and have it delivered in Chiang Mai? You are at the right place at Cake 2 Thailand Chiang Mai bakery. 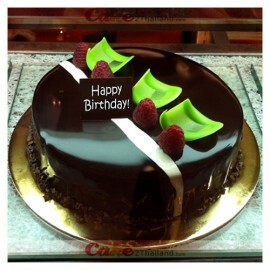 And the nice thing is that you can easily personalize most cakes, for example with a nice photo or a suitable text. Ordering is done wherever and whenever you want - how easy is that! All you need is an internet connection. In addition to the basic cakes, which are super tasty, fresh and beautiful, Cake 2 Thailand also has a large assortment of unique cakes for special occasions. Such as special children's cakes, 3D cakes or cakes for holidays such as Easter and Christmas. Free delivery in Chiang Mai city areas. Big Nemo 3D Cake - 3 pounds choose from chocolate or vanilla flavor. Free delivery in the city areas of Pattaya, Phuket, Chiang Mai, and Bangkok. We also have more 3D cartoon cakes to choose from. 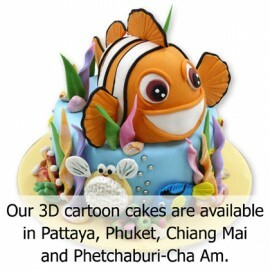 Please click here " 3D Cartoon Cakes " *** or at the top menu. We can do custo..
Black Forest Cake 2 pounds is a delightful chocolate-cherry cake comes from Germany also known as the "Schwarzwälder Kirschtorte". It is a classic chocolate cake with cherry, butter cream and whipped cream. We deliver Black Forest cakes directly home to your door! Available to al..
Blueberry Cake 2 pounds. We deliver cakes directly home to your door! Available to all cities in Thailand. Free delivery in the city areas. Deliveries outside the city areas may be subject to a delivery charge. We will let you know how much when we find out the delivery address or after we receive y..
Chocolate Cake 2 pounds. A delicious cake full of dark chocolates with a creamy, delicate chocolate filling of ganache. We deliver cakes directly home to your door! Available to all cities in Thailand. Free delivery in the city areas. Deliveries outside the city areas may be subject to a delivery ch..
Chocolate Cake with Extra Chocolate, decorated with milk chocolate shavings and fresh strawberries, raspberry and blueberries. 2 pounds - Serving 6-8 people. 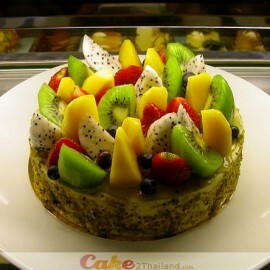 Free delivery in Bangkok by Cake 2 Thailand ® Same day delivery now available. Place your order by 6pm. (US Time Zone) or 12pm. 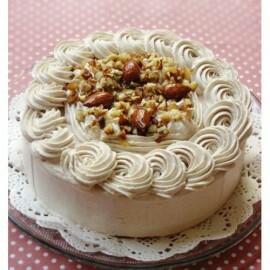 (UK Tim..
Coffee Cake 2 pounds is a delicious alternative to the classic cream cake. This coffee cake filled with freshly whipped cream. This delicious treat is perfect for the coffee or tea. We deliver cakes directly home to your door! Available to all cities in Thailand. Free delivery in the city areas. Del..
Fresh Fruit Cake 2 pounds. Who does not want a piece of cake with some fresh fruits? This cake is generously decorated with delicious fresh fruits of the season. We deliver cakes directly home to your door! Available to all cities in Thailand. Free delivery in the city areas. Deliveries outside the ..
Fudge Raspberry Marshmallow relaxing with a pot of tea and our special chocolate cake 2 pound. 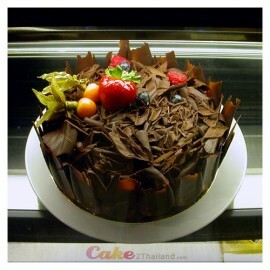 Special recipe from Cake 2 Thailand ® Presented in a beautiful gift box. Sure to be impressed. Free delivery in Bangkok and surrounding area. Same day delivery now available. 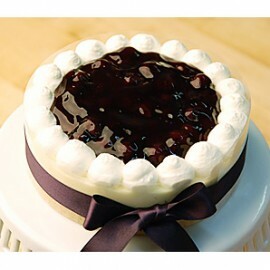 Place your order ..
Royal Chocolate Cake, G8 - Servings 6-8 persons. Royal Chocolate Cake decorate the cake with the rest of the chocolate praline is special recipe from Cake 2 Thailand ® Presented in a beautiful gift box. Sure to be impressed. Free delivery in Bangkok and surrounding area. Same day delivery now.. 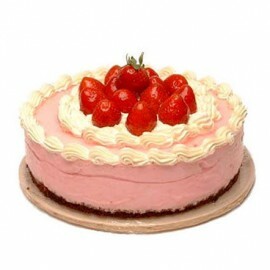 Strawberry Sponge Cake 2 pounds is a very fresh and light cake with a good taste of strawberry. An excellent option for a hot summer, when you want something sweet and cool, amazing juiciness make you fall in love with every bit. Perfect for Mother's Day or for a birthday! We deliver strawberry ..
Tiramissu Cake 2 pounds - It comes from Italy, it is one of the favorite candies in the world and it is one of the best coffee cakes. It's tiramisu. This is an exclusive, delicious cake and you have it every time you like to pamper yourself a little. 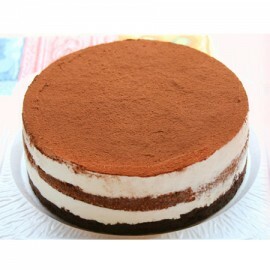 We deliver tiramissu cake directly home to yo..